Arising early, my blog was updated. The other night at Martins in the dark typing somehow, the whole Argentinean document disappeared never to be recovered. Luckily, it is on the web. So, four days had to be updated. The sooner events can be recorded the better. A much more vivid description of things can be portrayed soon after the event. Fortunately, the web was fast in Tunuyán. I am now captioning the photographs in Spanish. My own vocab and a dictionary are being used. Google translate is of no help to me from a learning point of view. It is also very literal in its translations. An empty long neck had to be returned to a Kiosco and a few things bought at Vea. On my return to the hostal, the owner Hugo, came in for a chat. He rides mountain bikes. He asked me into his house to meet his wife and family. We shared Mate and generally just yarned. So much for an early start. Lunch of empanadas, red wine and ice cream was enjoyed in the company of his family. These empanadas made by Bibi were just the best, the number consumed was beyond count. I am finding many Argentineans are very much like Australians and Kiwis. They enjoy BBQ’s, sport, a drink, food and a good laugh about most things and above all are super friendly. I finally got away about 1400 and slowly meandered south on the flat road. It was such a beautiful spring day, no wind, and warm with a clear sky. The Andes were lining the horizon to the west. Today they were not so hazy. In Pareditas, a stop for bananas was made, from here the road forked, the main road, asphalt took a loop to San Rafael, the other, gravel. The route to San Rafael was taken. There were gauchos (A cowboy of the South American pampas) riding along the road side in the vegetation. Soon the pueblito of La Correta was arrived at, a fiesta was in process with a band playing, people dancing and Gauchos with their horses everywhere. A stop for half an hour was made listening to the band and talking to a couple of guys on the roadside. Everyone was having a great time. Plenty of borachos were about. It was too risky to leave the bike somewhere and participate. I had a good view with others from the road sitting on the guard rail. By now the need for a camp was arising. Some 5km down the road, which now was just running through dry sandy country, again with almost no vegetation. Soon a farm house was arrived at. Pulling in off the road, a man was seen to be watering plants around the house. Asking him if I could set up my tent for the night on his property, he said it was fine. His name was Jose, he had a 1000 acres here, growing beef and potatoes. It was really desert country. He had plenty of ground water so was lucky. Around the house the water was 70m underground but had to be pumped up. I set up under some shelter trees on a good slope to assure a sound sleep. I had been carrying a full load of water all day so did not require any. Fried potatoes were enjoyed with salami and bread. A cat came and hung around the camp, eating whatever it could find. It is the first time observations of a cat eating potato peels had been witnessed. Life is tough out here and opportunists are the survivors. Up early and sneaking off down to the paddocks to do some knee bending out of harms way, a cloudy day was in the making, though it was still mild. Back at the house José’s workers were turning up. 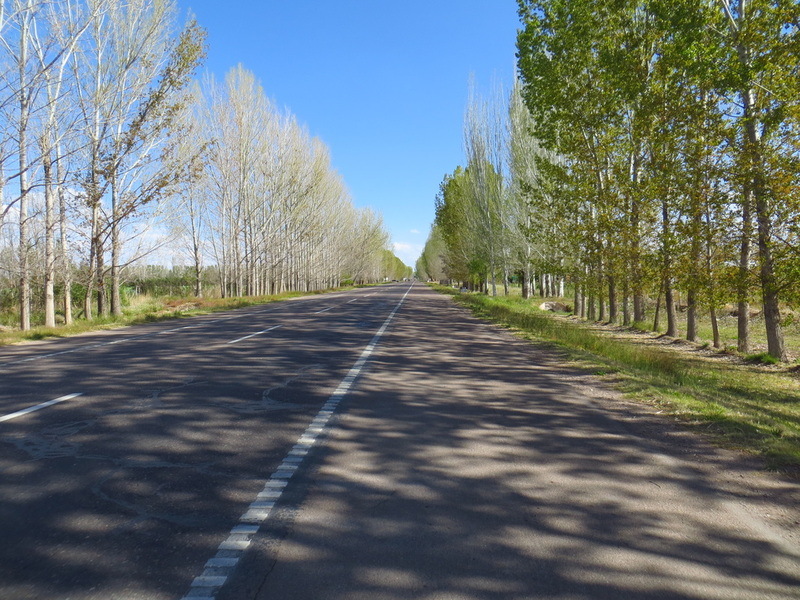 They were planting more Poplar trees for wind breaks and shade. Last night José had wet all the sand around the house and watered all the trees.. This had created a microclimate. For the first time for weeks there was dew on the tent. José was thanked and he gave me a full bladder of water for the 80km of road without facilities. Farms are good to camp at, though there are always animals hanging about and their waste and fur or feathers are always about under foot. Camping in an environment unused by man always feels cleaner. It may be dusty but always clean dust. Camping in that disused house the other night, left me feeling positively dirty after being covered in the dust inside the building. Give me a dusty creek bed any day. Out on the road, a very gentle incline was being negotiated for miles. Then a vista become available, the first time for a while, a lot of country could be seen from an elevated position. From here, a great 7km cruise down was enjoyed, not fast but so nice not to have to pedal after so much flat country for most of Ruta 40 for the last couple of weeks. Hunger soon set in and at the 50km mark, salami and Martins dulce were enjoyed on bread, not together one might add. Traffic was reasonably heavy. The road was dead straight in many parts. Some cars, mainly European, Mercs, VW’s, and Peugeots were flying past, some at speeds in excess of 150km/hr I guessed. Most countries here do not have traffic police outside the cities. Some guys were driving a front end loader along the roads edge, they were asked for water, as my drinking bottles were almost dry, they had little. Soon, quite unexpectedly, the pueblito of Las Paredes was arrived at, just before reaching town, a VW pickup pulled over, an arm was extended outside the passenger front window, in the hand was a bottle of drink. It was the same guy who had been driving the front-end loader. It was a large bottle of icy lemon. Gestures like this, never cease to amaze me here in South America, the people have been absolutely so kind when it comes to unexpected gestures. Once in the urban area, a kiosco was stopped at. The people had accommodation. It was a full size house, two bedrooms, kitchen etc. Deciding to stay the night, a Mate was made. From here, three hours sleep was enjoyed on the big comfortable bed. I never realised how worn out I was. Riding this flat country, though it is easy, you are generally pedalling the whole way. Big distances are ridden, alot of energy is required to do so however. My weight now, is at a steady 64kg, eat what may. It is a healthy weight but doesn’t leave much leeway if one was to fall sick or get diarrhoea again. Hopefully, now well away from the tropics and that oh so! delicious street food in Ecuador and Peru, my health will stay as it should be. Some washing was done, it got a good smoking while I was asleep, the owner was heating up the house hot water with wood in the burner alongside the dwelling. Many people heat hot water like this. It is rapid and does not require the water to be kept warm all day. They only heat it when needed. With all the Eucalypts growing around towns, wood is not an issue. Last night, a noise was heard on the roof of “my house” All be it for one night!. I could not believe it, rain was falling without introduction. It was almost unbelievable, proper rain like this, had not been experienced for all of five months. What’s more, it was coupled with an electrical display, there is nothing better than climbing into bed nice and cosy with rain coming down on a tin roof. New homes, today, deprive many of this experience with insulation under iron or tile rooves. It was quite bizarre, that my accommodation for the night was here. The day had intentions attached to it. Those of camping. Intentions, in many ways, nothing more than the word at the beginning of this sentence. . Standing under the carport, the gentle rain vertically dissected the view that was revealed in the reflection of the streetlights from the roundabout at the front of the property. .
At some stage, setting up the tent and packing up, is going to have to be performed in rain. Not since Ecuador, has this been done, even then the rain had ceased. Hopefully, prior, to when it becomes common place, as it may well do, further south. I have thought alot about this and feel the tarp may come in very handy, being set up first, enabling the erection of the tent beneath it in a somewhat dry environment. I dare not think of a rain coupled with a wind scenario. Prior to going to bed, a movie starring Matt Damon was enjoyed. It depicted a large company with two reps in country Pennsylvania trying to buy up rural properties for the extraction of gas using fracking. It was a movie depicting the company, rightly so, as the bad guys, in a small rural town. It was a feel good movie, offering money over lifestyle and values. The latter two prevailed. The gentle sound of rain on the roof was an elixir for a rapid departure from the conscious world. Leaving about 0830, there was a bike track alongside the road. The highway, not having a shoulder, made this alternative almost mandatory. Ambling along, another cyclist joined me. He had just finished work as a security guard for the night, a nice young guy. He also had a day job painting. He and his brother rented a house in San Rafael, for 800 p/mth, even at bank rates that’s $A40/wk. Though, wages here, for normal people do not allow them to afford much more. Lucky you, if you are making good money in AR! We rode together chatting all the way to town. Outside a huge Vea supermarket, a guy was selling fresh asparagus and bananas from Ecuador. The asparagus were put on the back of the bike, the bananas were demolished en situ. A woman came up to chat at length, it was very lucky, she kicked the stand and the bike fell on her thigh. The vendor and I reacted immediately. We were all very lucky. The occurrence saw us all laughing at its conclusion. Though, I was concerned, she had been hurt. Importantly, injury had been avoided. Riding on, the town had a nice feeling about it, trees lined the streets, they were wide, kerbs likewise and the atmosphere permeated an ease. There were lots of ski hire shops and fishing gear establishments. Lonely Planet had listed the hostel Tierrasoles as fairly affordable. This was located. Right now is very quiet here for tourism, a dorm to myself was booked. The rest of the morning, before the shops closed at 1300 or there abouts, was spent getting a new battery installed in my watch, and wandering. The road from here to Chile, will see me cover some distances where tiendas, or “kioscos” now, are not passed for a day or two at a time. A bus was caught back to the large Vea supermarket. For the first time since commencing, meat was bought to cook. With it, green beans and broccoli were going to compliment the asparagus. A good dose of blanched green veges with a steak was needed. The hostal had a great kitchen with all utensils at my disposal. The facility was everso welcome. Leaving the supermarket, no bus was about, so the 8 blocks to the hostal was trodden. Like most towns here in western AR, siesta time is just that, everything is literally closed. Except for a few kioscos and the bigger supermarkets. The streets resemble those of a ghost town. People have told me, over on the coast, the practice is not so widely spread within the retail sector. Those plastic bags really play havoc on the circulation in your fingers when they are carried for any length of time. The journey was a mobile game of musical shopping bags, trying to relieve the enormous pressure per square inch near the terminus of fingers on both hands. The afternoon was spent, hanging about, talking with the owner, Ricardo, a cool guy, about the roads ahead and enjoying a malbec. More wine has been drunk in the last three weeks than in the last eight months. After all, my location is in one of the world’s great wine producing regions. That of Mendoza. Drinking, for me now is a very insignificant part of my life. Indulging, is only done, when deep in my sub conscious, I feel relaxed about my belongings. I have my home, my kitchen, my transport, my clothing, most of my food, my identification and my tool for communicating within easy reach of most people near me. Unless their security is comfortably resolved, my social activities are, as always, enthusiastic but always in control. After all, this jaunt, through, this most fascinating and burgeoning of continents on this planet, is not a holiday. It is a journey, a look at another language, experiencing other cultures, giving my body and mind a break from the monotony of 21st century life. That where. Sadly, many people are caught up in the expectations of others. I was guilty of that at times. “A breath of fresh air” best describes my disposition now, for lack of better words. As my limited knowledge of Spanish increases, so does the richness of my social experiences. Thinking, only just yesterday, as the asphalt and the gravel that give it durability, passed beneath my vision ahead of the front wheel, how my experiences here in South America have slowly gotten richer from a social aspect. Back at Caucete, Hugo and Bibi, would have, possibly not invited me in for lunch, had we not been able to communicate beyond hello, good ,nice, thankyou, yes, no. After all, the only reason to learn a language is to communicate. For most people travelling today, especially those on organised tours, the experience is largely visual only. Interactions, generally, are limited to locals who know how to play the game. I have experienced these holidays. They are an escape from work, nothing much else. For me. Now, at this point in my life. The anticipation, excitement, challenge, euphoria, expectations, possibilities, coupled with the road ahead, allow me to have so much more than glancing interest in my immediate future. The financial demands from this sort of life are not a huge drain on funds accumulated throughout my working life, thankfully. Life for me now, is now one big adventure, maybe, this is where, we, as humans have lost the plot to some extent. This real adventure, is now being replaced, and in many cases, by the pursuit of money and upon success, receiving the praise of others for doing so. Ones holidays, in their excesses, only reflect all of the above. Within this reflection, the cycle is perpetuated. Can I take this opportunity for one to take a little time out and look at your life. If you are really happy, my hat is off to you. If not, how do you want to grow old and who with? Or, more importantly, what do you want to do with your good health. Of all the gifts we have been bestowed, health is the most sacrosanct. Oh, the spillage from a guy in his late fifites, living childhood dreams and not acting as possibly expected, ah! So refreshing. Believe me. Your body and mind will only thank for this kind of behaviour!!! Whatever it is. Bibi, Hugo conmigo y ellos perritos. Muy tranquilo, manzanas estuvieron creciendo en las fincas. Rio Las Peñas, muy seca con muchas arena.